(Nanowerk News) A pair of light waves - one zipping clockwise the other counterclockwise around a microscopic track - may hold the key to creating the world's smallest gyroscope: one a fraction of the width of a human hair. By bringing this essential technology down to an entirely new scale, a team of applied physicists hopes to enable a new generation of phenomenally compact gyroscope-based navigation systems, among other intriguing applications. 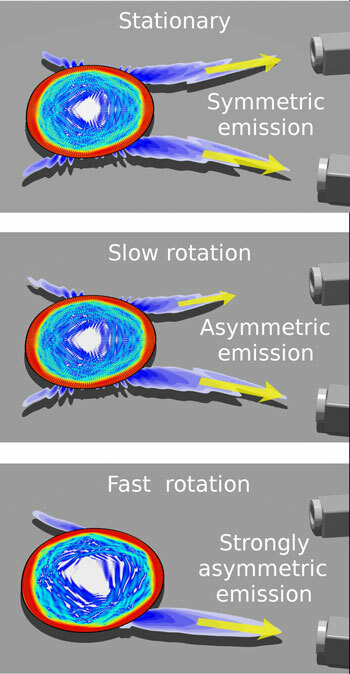 Ge and his colleagues - physicist Hui Cao and her student Raktim Sarma, both at Yale University in New Haven, Connecticut - recently published their results in The Optical Society's (OSA) new high-impact journal Optica ("Rotation-induced evolution of far-field emission patterns of deformed microdisk cavities").